If you want to make something extra special for your Holiday dessert but still want it to be simple this final Holiday Cake Week treat may be the one for you… It’s a Pull Apart Cupcake Christmas Wreath. 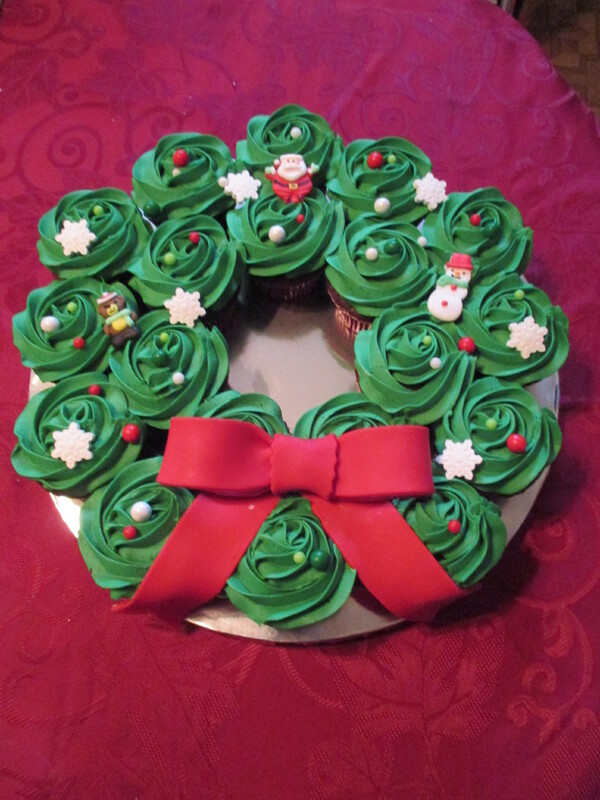 You will need 19 cupcakes to replicate the size wreath I created. I opted to use a chocolate box cake mix, but, feel free to use your favorite cupcake recipe. I went with a box cake mix to make this as easy and as quick as possible. 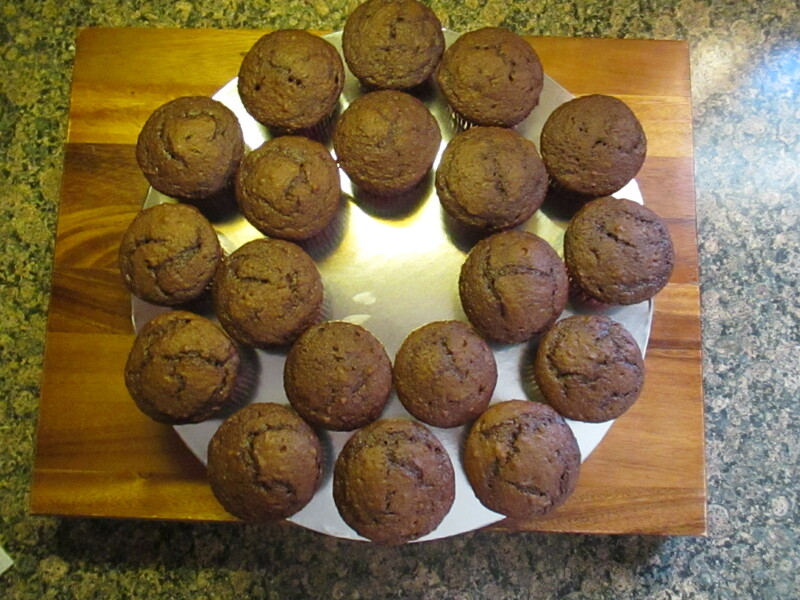 Once the cupcakes cooled I arranged them on a 14-inch round cake board. Next, I made my go to Fluffy Vanilla Frosting I always use for decorating. 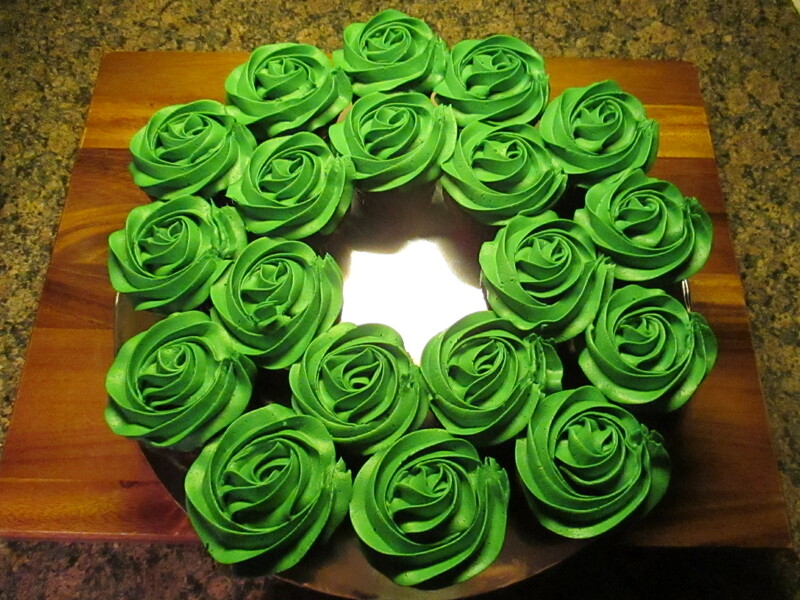 After tinting it green I used a Wilton 1M tip to pipe swirls on each of the cupcakes. Quick tip… Prior to frosting make sure the cupcakes are close together, practically touching, this way when you frost them you won’t have too many gaps between them. Now it was time to decorate. I started off by creating a fondant bow. To do so, I rolled red fondant to 1/16-inch thickness. I cut four 6 x 1 1/2-inch rectangles. In two of the rectangles I cut out a triangle on one of the shorter sides. I also cut a 3 x 1 1/2 rectangle that I used for the bow center. To create the bow, I folded the two longer rectangles without the cut-out in half and stuffed the loops with tissue paper so they could keep their shape, I used a little water to adhere the ends of the rectangles together. Next, I wrapped the shorter rectangle around the two joined ends of the folded rectangle and used a little water to join the ends of the short rectangle. Finally, I placed the rectangles with the cut outs in the center of the bottom of the cupcakes and carefully placed the bow piece on top. You can use a little water to adhere the piece together if you are concerned about it falling off. To finish off the decorating I used snowflake candies, Sixlets and other candies to give the wreath a more festive look. And that’s it! Feel free to switch up the colors. You could stick with white frosting and decorate with red and green for a festive look or with shades of blue and silver for a winter wonderland look. The possibilities are endless.